It all began with a dress. The dress was an elegant one: designed by Carolina Herrera, it was whimsical in design, with detailed lace set in garden-inspired patterns. When Ashley was approached to make a necklace and earring set for this outfit—which was destined for a wedding—she was immediately inspired. Ashley found herself intrigued by the intricate lace patterns, and sketched an elaborate collar necklace that composed of medallions that had four separate designs: each reflected an element of the design of the dress. Ashley chose her favorite for the matching drop earrings. After pulling different themes and motifs from the dress, she customized the neckline to fit the dress exactly. She talked with her client about what she hoped the necklace and earring set would represent, and learned that her client was attending her eldest daughter’s wedding, and that she wanted these pieces to be a celebration of her the event and what it symbolized. Blush pink sapphires were chosen as the featured stone that would cover the necklace: these represented the little girl Ashley’s client had raised into a lovely young woman, now all grown up. Production of the necklace involved carving each tiny element of the necklace and earrings out of wax, and then casting the medallions individually. Every rose gold swirl, vine, star, and cross-hatch had to be formed expertly and exactly. Then the many sparkling sapphires were added, in their hues of blush-pink. Ashley wanted the necklace to exude a warmth and a glow, to give the impression of a natural garden preserved in gold and precious gems. 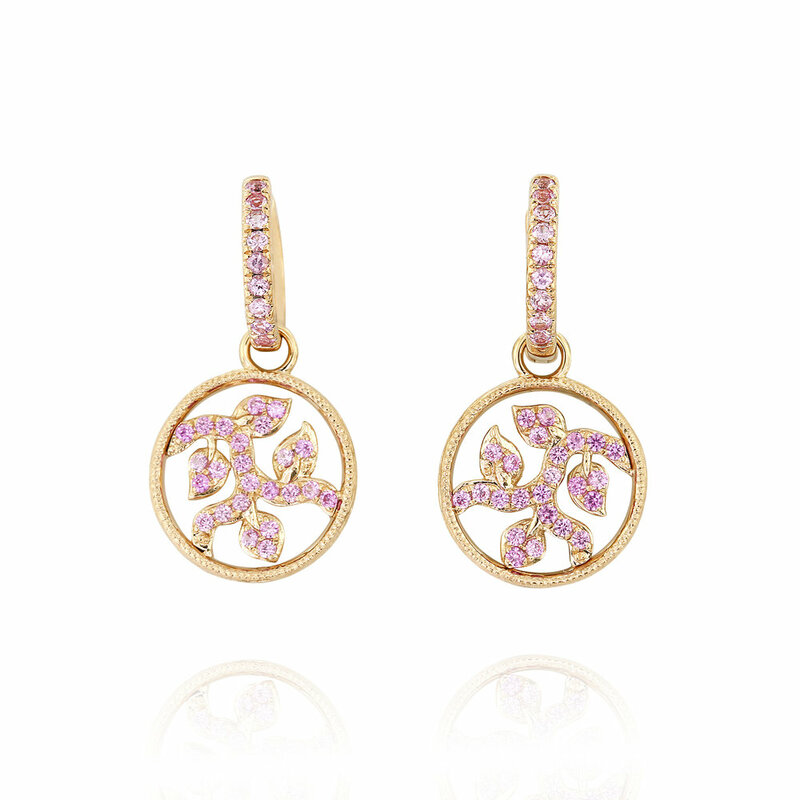 This feel was achieved through the combination of rose gold and blush-pink sapphires. The final result more enchanting. A symphony of pink and rose hues, the necklace lays elegantly against the collarbone. The earrings seem to twinkle as they dangle, a perfect match for the necklace.